* Feasibility studies and reality checks – can this be done and at what cost. * Material selection – what’s right for your project – cast stone, precast, or cast GFRC. In addition to the more traditional choices ACS offers you the widest range of options including GraniteCast™ and KasotaCast™ - cost effective solutions for truly unique projects. * ACS GreenStone30 and ACS GreenStone40. Our proprietary mix designs with 30% and 40% recycled content respectively were developed for LEED intended projects. * By utilizing 100% wet cast production techniques at ACS - not only is the quality of our product ensured and energy consumption reduced, but there will always be a perfect match between our machine made standard product and traditionally cast custom products. Contact us to find out more about the Wet Cast Advantage. * Mix Design assistance. ACS offers you the widest range of options in the industry – color, texture and aggregates. Visit our design center to see the unlimited range of possibilities or contact one of our architectural reps for assistance. 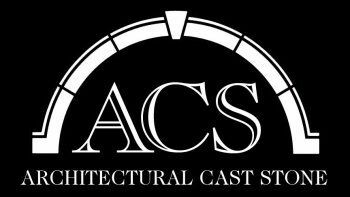 * AIA Continuing Education Credits – Cast Stone Connection design, Architectural Design with Cast Stone and The Making of Cast Stone & Plant Tour. Earn 1, 2 or 3 units depending on your choices. * Let us help you reduce your carbon footprint of your project. ACS continuous effort to achieve a zero waste stream; ever decreasing energy consumption in production, ever increasing use of recycled materials; and 100% wet cast production are just a few examples of our efforts to reduce the carbon footprint of the built environment.